Cookie-making day, today. Actually, I think I’ll be making cookies for a few days, considering I didn’t start making them until 8pm. 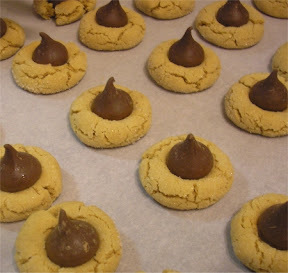 Here is the first recipe – one of my favorite – “Peanut Butter Kiss Cookies” (link), or “Peanut Butter Blossoms” – whatever you call them, I love them. The recipe below is from the Hershey site. They have a decent list of recipes there. Worth checking out. The recipe made about 48 cookies and were very easy to make. The only thing I would change is to let the cookies cool a bit before putting the chocolates on. We had quite a few melted chocolates, and they took a while to firm up. Maybe a half-hour in the fridge for the chocolates would have been helpful. But it’s all aesthetics, because my boys will eat them no matter what, and actually liked it when they were melted. All in all, decent recipe. I might try the chewy version next time. Burger King has unveiled a “healthy alternative” to regular fries – apple fries. Well, skinned apples, shaped like fries. Not actual sweet apples, fried up in grease like a mini-pie, shaped like a fry (which is what MY mind goes to when I hear the words “apple” and “fry” put together). And I’ll be honest, when I go to a fast food restaurant, I don’t kid myself that I’m eating healthy in any way. I go there knowing I will get fast, cheap, not-the-best-for-you food. Franny models the apple fries. 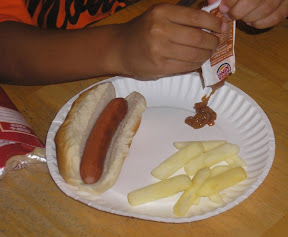 We had apple fries and turkey dogs. BOTTOM LINE: The kids liked them. I thought they were OK. I don’t think I’d actually buy them for myself, though. They kids weren’t sure that they would substitute regular fries, by choice, with the apple fries, and were sure to make that clear to me in a tone that said, I like them but please tell me the regular fries aren’t extinct. If they were 2/$100, they’d make a quick pit stop snack. But apparently they are not 2/$100. At any rate, if you’d like to check them out for free (or get you a dinner, lunch – cones for the fam) – I’ve got 2 $10 gift certificates to give away. 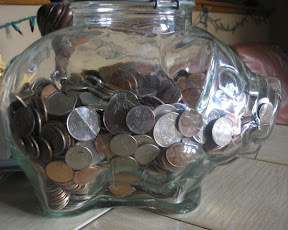 Check out the piggy below and try to guess how many dollars are in there. That’s our Mad Money Pig. We’re spendin’ her up this weekend. Leave your guess in the comments, just for snorts and giggles. A winner will be chosen randomly, so don’t squeeze your brain too much over it. Entries close Friday, August 8th at 11:59pm CST. 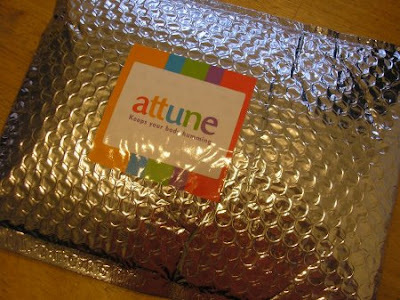 Recently I was contacted to see if I’d like to sample some probiotic bars from Attune. Since I’m somewhat familiar with probiotics, I agreed. We’re a family who drinks Keifer (thick, sparkly, tickle-your-tongue, probiotic yogurt drink). It helps with some of the digestive issues we’ve had, and is a healthy snack alternative. I was curious about the bars that promise to deliver probiotics in a different form. It came with a folder full of information on probiotics. 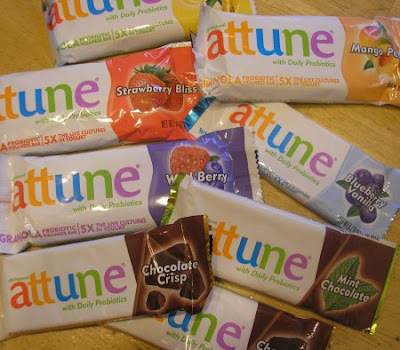 Inside the shiny sliver package – a goldmine of bars: Lemon, Mango Peach, Strawberry Bliss, Blueberry Vanilla, Mint Chocolate, Wildberry and a couple Chocolate Crisp bars. The kids were ready to dig into them and try them out. 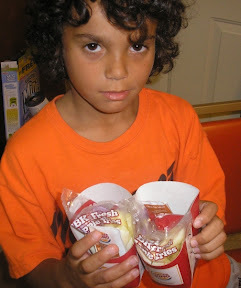 We sampled a few different ones and placed the rest in the refrigerator (they arrived with a cool-pack to keep them cool and are supposed to be refrigerated). The bars were about the size of a granola bar, maybe smaller. Chewy and relatively tasty, with a yogurt-y “frosting” on each bar. Major drawback: sickeningly sweet. If you look at the nutrition info on the website, the first few bars don’t look so terribly bad (12g carbs), but then, those are not the “granola” bars — they’re the chocolate bars. No one in the house was fond of the chocolate bars. The granola bars have nearly double that amount of sugary impact in them (22g carbs). That’s just too much for me. Keifer’s got a significant amount as well; the tendency to “sugar up” is not passed over even in the organic world. Bottom Line: The kids liked them well enough, and it may be worth buying, especially after a child is on antibiotics, as a way to deliver the probiotics. But for me… my fiber pills have probiotics in them, and there’s no sugar involved. if I’m eating something sweet I generally go all the way and eat a real sweet, skipping the healthy part on the way. I’ve purchased a few Bean Cuisine soups recently. They come in a bag the size of an eggplant, all dry ingredients (the black bean ingredients are: Beans, Spices, and Red Bell Peppers) and are under $5. For the most part you add some veggies, onion or peppers and maybe some meat if you have it. You could also just serve/make the soups as they are. Today I made the black bean and added chopped carrots, onion, a pepper, a can of V8 and about 1 cup of frozen corn. Oh, and a leftover piece of pork we had. It was delicious. The kids loved it. Topped with a bit of cheese and sour cream — yum. We had tortilla chips with it, too. Bean Cuisine makes a few different soups. We’ve had the split pea one and the lentil one. All were very good and ended up being devoured by the family. I give these puppies a thumbs up. If you google them you can find them in many different e-places. There is a 6-pack at Amazon . But, like I said, I pick mine up at Cost Plus and keep them on hand for a simple dinner.